Why you can not follow my instructions? What are the difficulties you encounter in this tutorial? I did follow all the instruction but still got no sound. I used to have Scid with sound in my old Windows Vista laptop. Since I moved to this Windows 7 laptop on May 2013 I never again hear a "bip" in Scid vs PC or Scid itself. My hard drive has 364 Giga free. I have almost 100 applications installed and no trouble with any of them. OK, this is strange, I have windows 7 as you and it works, I installed different time Scid in different place of the PC. can you send this ? then check the volume mixer if SCID is in. 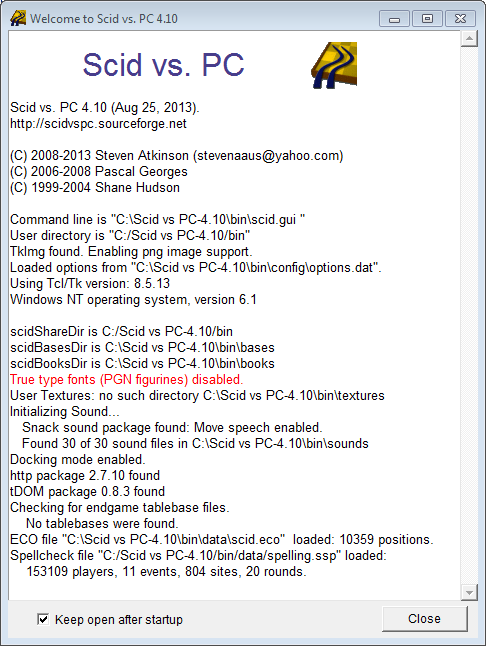 Scid vs. PC 4.10 (Aug 25, 2013). Command line is "C:\Program Files (x86)\Scid vs PC-4.10\bin\scid.gui "
User directory is "C:/Program Files (x86)/Scid vs PC-4.10/bin"
TkImg found. Enabling png image support. Loaded options from "C:\Program Files (x86)\Scid vs PC-4.10\bin\config\options.dat". True type fonts (PGN figurines) disabled. Snack sound package not found. Checking for endgame tablebase files. ECO file "C:\Program Files (x86)\Scid vs PC-4.10\bin\data\scid.eco" loaded: 10359 positions. 153109 players, 11 events, 804 sites, 20 rounds. I get sound up and down with no trouble. Anyway this is a samsung laptop with special keys to move sound up and down and on/off and Samsund drivers/menus to do it. Also this is not an intel processor. It is AMD A6. I did exactly as told and still snack not found. This is 64bit version of windows and that snack say 32. In fact I give up. This is over patience. Thank you. The Scid version I installed is the 32b on a 64B system. Many thanks for your final tip. Now sound works here as well. After installing the 32bit version inside the x86 applications folder. Happy user here too. - In Export PGN dialog, add an option for "Space after Move Numbers"
Databases open faster (Linux/OS X only - "avoid the time consuming file locking". Windows is in testing). Dont insert newlines into PGN copied to text buffer... Some web PGN browsers don't work with newlines following movenum. eg "10. Nxc3"